Alaskan Fishing, Microgaming’s fishing-themed slot, comes with 243 ways to win, a bonus game, free spins, and multipliers of up to x15. Alaskan Fishing comes with 243 permanently activated paylines, which eliminates the need for players to manually activate paylines. Bets are placed in increments of $0.30 up to $15 per spin of the reels. Once players place their bets, they can hit the Spin button to set the reels spinning and hit winning combinations. Wins are paid from left to right. The slot comes with an Autoplay feature, which players can use to spin the reels automatically for a specific number of games. Players can also customize their gaming experience by altering the game settings. Alaskan Fishing, as its title suggests, deals with fishing for profit as well as for fun. The slot takes players to the icy Alaskan mountains, where they can fish to their heart’s content and win attractive prizes. The slot has some awesome graphics, audio effects, and bonus features—well in keeping with its theme. The reels are populated with symbols of fishermen, fishing trophies, salmons, bald eagles, fishing boats, fishing reels, fishing lures, and other fishing-related symbols. The Alaskan Fishing Logo serves as the wild symbol, which can substitute for other symbols and help players complete winning combinations. However, the wild cannot substitute for the scatter to unlock the free spins round. The Alaskan Fishing Logo symbol can appear in the form of stacks to increase players’ chances of winning payouts. If players land five Alaskan Fishing Logo symbols along an active payline, they will win the top fixed payout of 500 coins. Alaskan Fishing has two scatter symbols—the Fisherman symbol and the Tackle Box symbol. If players land combinations of 3, 4, or 5 Tackle Box scatter symbols anywhere on the reels, players will win scatter payouts of x5, x10, and x100 their bet amounts. If players land at least three Tackle Box symbols anywhere on the reels, the free spins round will get activated and players will receive 15 free spins. The free spins round can be re-triggered while playing a free game. To unlock the Fly Fishing Bonus Game, players need to land the Fisherman symbol on the fifth and first reels. This game displays nine fishing positions, and players should select five of them to reveal bonus prizes in the form of multiplier values of up to x15. 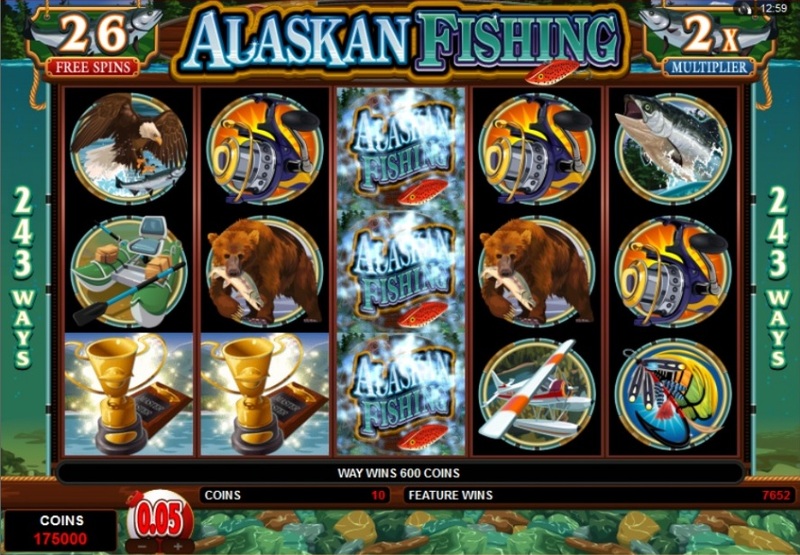 Although the top fixed jackpot of Alaskan Fishing is on the low side, players can up to 61,000 in the main game, 1,125 in the bonus game, and 121,500 in the free spins feature. This makes it one of the most lucrative and popular slots in the Microgaming portfolio–one that players simply should not miss. The slot is available at any Microgaming casino.